Ok, what makes you think I would buy this shirt? I think you would buy this shirt if you appreciate style but value substance! The quality of the fabric and buttons that make up this shirt are not properly appreciable by just looking at a photograph of this shirt on a smartphone or liquid crystal computer display. The buttons used in the making of this shirt are sourced from Germany and are still primarily targeted at the craft and hobby sewing market. The buttons used for this shirt are of a higher cost and higher grade than buttons commonly sourced for dress shirts. The fabric used to make this shirt is 100% Kona cotton. Kona cotton is a patented and trademarked type of cotton made with a more expensive and select grade of cotton fiber woven into a high thread count tight weave fabric. The tight weave and high thread count that define Kona cotton make for a fabric that is much stronger and more durable than cotton textiles of the same weight. Kona cotton is also manufactured with the least toxic and allergenic dyes available. Kona cotton is approved for the bedding material of babies. Mass produced low quality fabrics colored with toxic dyes are a troublesome health and environmental problem. The eventual disposal of these toxically dyed fabrics is an issue. Toxically dyed fabrics eventually end up in landfills leaching toxins into local ground water and eventually poisoning the entire local ecosystem. Subtle poisoning of people wearing clothing made out of toxically dyed textiles is long term health problem. Kona cotton clothing is great for those with allergies or skin sensitivities. The wholesale cost of fabric for one of the All Occasions dress shirts is about the cost of a cheap button up men’s shirt commonly peddled at a big box discount retailer near you. A better and longer lasting shirt costs more to manufacture, there is no way around it. It is best to think of this shirt as a long term wardrobe addition. 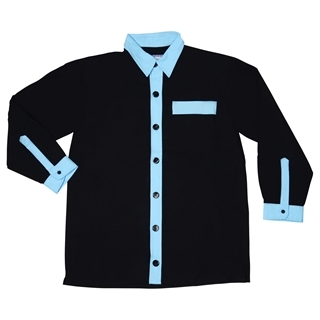 In addition to being well made and stylish this shirt is sewn together in the USA. We at Quantum Cat designs believe in doing our part to support American industry and provide jobs for Americans. We hope you support American industry as well by purchasing one of our fine dress shirts! America could still be considered a wealthy nation by economists, however; there are a lot of Americans struggling financially at this time who would value your support. Style Points: The name Blue Skyz comes from the old song Blue Sky by the Allman Brothers Band. I once listened to a nationally syndicated radio interview with Greg Allman where he talked about the background to the song Blue Sky. This old classic rock song was a love song written about a Native American woman that Allman was married to for several years in the 1960’s. Greg Allman’s one time wife was named Sally Blue Skies. When I picked out this light blue color I immediately thought of the song Blue Sky. I love the look that this light blue trim gives to any outfit. This color is light and relaxing and is good for sending out a casual and chilled vibe. This shirt is great for office work and down tempo nights out. This garment is a great one for casual late night bull sessions with friends and family.